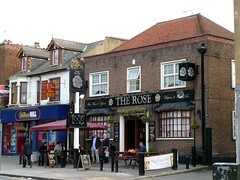 A pub in Bexleyheath, one of many along the main thoroughfare. Unusually for Bexleyheath pubs it has a little fenced-in patio at the front with benches, though there's also a (small) patio out the back as well. Ewan, Kake, bob, and Matthew visited on a Sunday afternoon in April 2009. The place was pretty much packed (unlike the other local pubs we visited), and sport was showing on prominent screens. We sat outside instead. When gellyfish visited in August 2007 the handpulls had Harveys Best, Charles Wells Bombardier, and Greene King IPA; on our April 2009 visit the Harveys and the Bombardier were still on, and had been joined by Adnams Bitter and Dartmoor. As of 2007, lunches were served every day except Sunday. Not sure what the current situation is. A sign spotted in April 2009 advertised karaoke every Thursday from 8:30pm. Accessibility: Two steps up to get in. No steps to the gents' once you're inside. Last visited by Ewan, Kake, bob and Matthew, 5 April 2009. Opening hours taken from the 2007 Good Beer Guide. Last edited 2013-05-10 07:57:39 (version 10; diff). List all versions. Page last edited 2013-05-10 07:57:39 (version 10).